Are you looking for an inviting church where you can worship and build a stronger relationship with God? If so, visit Faith Lutheran Church today. You’re invited to join us for Sunday church services in Shreveport, LA. We’re a growing church that strives to strengthen its members through Christ-focused worship, ministry and love. 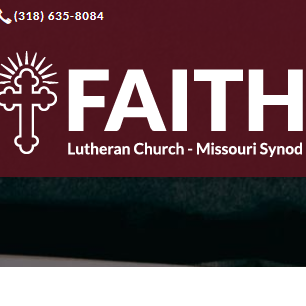 We’d love for you to make Faith Lutheran Church your church home. Since 1983, we’ve brought members of our community together to worship God. We’re followers of Jesus Christ. Come follow along with us at Faith Lutheran Church in Shreveport, LA. Call us at 318-635-8084 today to learn more about our worship schedule and upcoming events.